When, in mid-September, General David Petraeus testified before Congress on "progress" in Iraq, he appeared in full dress uniform with quite a stunning chestful of medals. The general is undoubtedly a tough bird. He was shot in the chest during a training-exercise accident and later broke his pelvis in a civilian skydiving landing, but until he went to Iraq in 2003, he had not been to war. In the wake of his testimony, the New York Times tried to offer an explanation for the provenance of at least some of those intimidating medals and ribbons — including the United Nations Medal (for participants in joint UN operations), the National Defense Service Medal (for those serving during a declared national emergency, including 9/11) and the Global War on Terrorism Expeditionary Medal (for… well, you know…). Petraeus is not alone. Here, for instance, is former Chairman of the Joint Chiefs General Peter Pace, a combat Marine in Vietnam, with one dazzling chestful of medals and another of ribbons. Medal and ribbon escalation has been long on the rise in the US military. Here, for instance, was General William Westmoreland, who commanded US forces in Vietnam, sporting his chestful back in that distant era. But the strange thing is: As you continue heading back in time, as, in fact, U.S. generals become more successful, those ribbons and medals shrink — and not because the men weren’t highly decorated either. 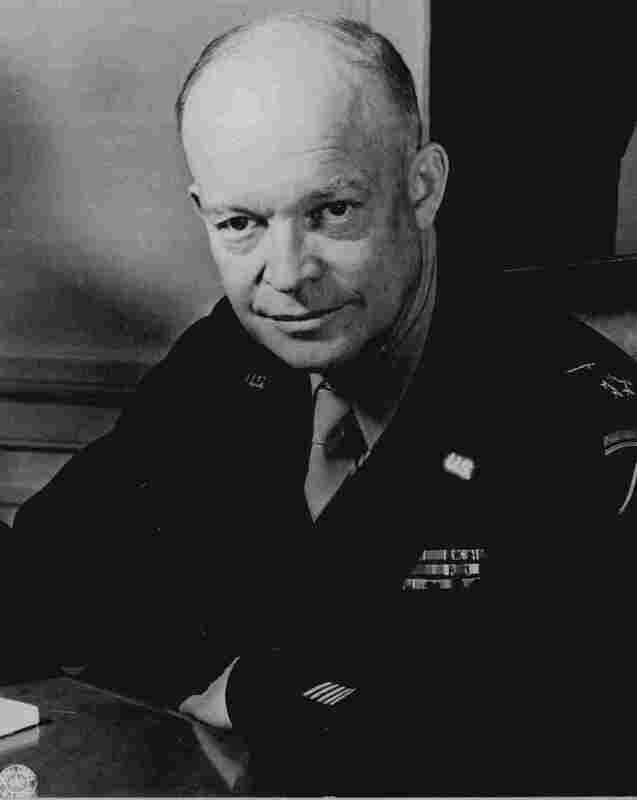 General Dwight D. Eisenhower, who oversaw World War II on the western front in Europe for the Allies seems, in his period of glory, to have chosen to wear between one and three rows. And General George C. Marshall, who oversaw all of World War II, after a distinguished career in the military, can be seen in photos wearing but three rows as well. When it comes to ribbon display, in today’s military the Marshall or Eisenhower equivalent would be Lynndie England, the infamous Abu Ghraib guard who was convicted by a military court in May 2005 for her abusive acts at that prison. By then, she had served four years in the Army Reserves and, as a photo just after her conviction indicates, she could already sport three rows of ribbons. It’s hard to believe that there isn’t a correlation here–that, in fact, there isn’t a comparison to be made. For all the world, when I saw Petraeus on display before Congress, I thought of the full-dress look of Soviet generals, not to say the Soviet Union’s leader Leonid Brezhnev, back in the sclerotic 1980s when, ambushed in Afghanistan, they were on the way down. Like the USSR then, the US, only a few years back hailed as the planet’s New Rome, has the look of a superpower in distress–and it’s hard to believe that generals with such chests full of medals, whether in the former USSR or the present USA, have the kind of perspective that actually leads to winning wars — or to assessing a losing war correctly. Consider what a retired Air Force officer, Lieutenant Colonel William Astore, has to say on the subject: "Those medals and militaria that our commanders wear are a kind of evidence. Our military, they indicate, is so busy patting itself on the back that its medal-bestowing has come to resemble those Little League tournaments where every kid gets a trophy, win or lose. We’re so busy celebrating how great we are that we’re failing to face reality. Not all problems can be solved by applying more elbow grease and shouting ‘Hooah.’"
Not all problems can be solved… but in the meantime, it’s sure a hell of a great look.